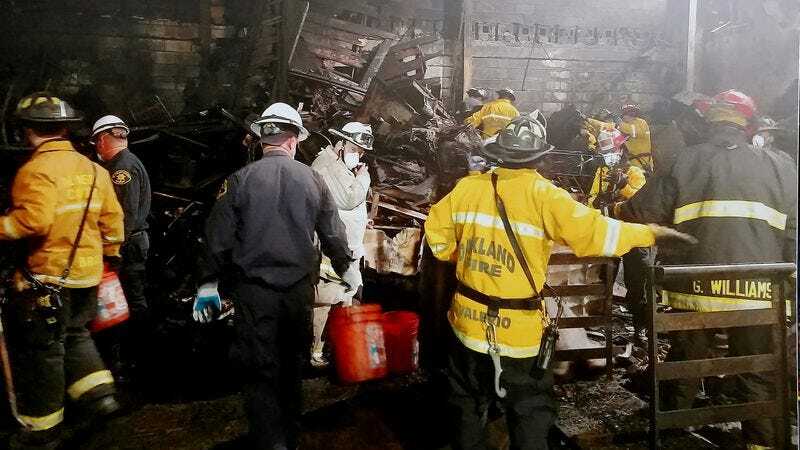 Back in December, a fun night out turned into a fiery nightmare when flames ripped through the Oakland, California DIY warehouse venue Ghost Ship, killing 36 people in the deadliest building fire in the U.S. in more than a decade. At the time, Ghost Ship founder and property manager Derick Almena was criticized for allowing multiple building code violations that turned Ghost Ship into a “death trap,” according to the Los Angeles Times. And now Almena and Max Harris, the venue’s “creative director” who was in charge of the electronic music concert that took place on the night of the fire, have both been charged in connection to the tragedy. Both Almena and Harris have been arrested and charged with 36 counts of involuntary manslaughter, one for each of the people killed in the fire. Prosecutors allege that the two knowingly created a fire hazard by allowing dangerous conditions—including a lack of fire extinguishers and flammable materials stacked “from floor to ceiling”—in the venue, conditions exacerbated by the fact that Almena allowed people to live there off the books. Additionally, on the night of the show Harris allegedly blocked off a second stairwell to the upstairs floor, allowing attendees only one escape route down an illegal staircase made of wooden pallets. If found guilty, Almena and Harris could face up to 39 years in prison, according to ABC 7 San Francisco. Families of the victims have also filed a lawsuit against the duo.